You’re team has made it to the Super Bowl; celebrate, cheer, throw big Super Bowl parties, just enjoy it, but for the love of all that is good and merciful, STOP PUNCHING POLICE HORSES. When I saw the headline, another Eagles fan arrested for allegedly punching a police horse, I will admit I laughed. I laughed the way one might laugh at someone who has suffered an electric shock because they have peed on an electric fence. It was a derisive unsympathetic type of laughter. You’re not going to win a battle with a police horse. Have Eagles fans suddenly become Wylie Coyote? When your Acme canon fails to fire, don’t stick your face into it to find out what happened. Did you think you were playing the Broncos in the Super Bowl and you felt a sudden uncontrollable rage against all equine? Were you so happy you just had to punch something and a police horse seemed like the best choice? Were you just really drunk? I know you’ve got that statue of Rocky in Philadelphia, but punching stuff isn’t the best way to celebrate. Just relax and enjoy the game against the Patriots. The New England Patriots–Paul Revere was a patriot from New England–Paul Revere’s famous midnight ride–Paul Revere rode a horse! 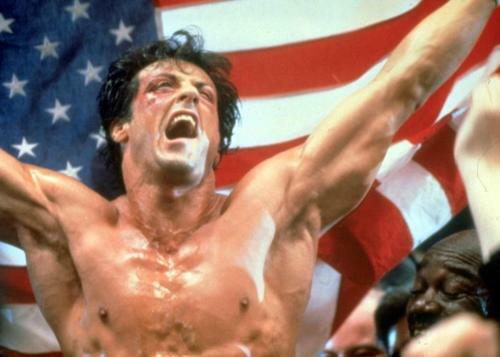 Rocky celebrating a huge victory–ten minutes later he was arrested for punching a police horse. It’s Philadelphia; they’ll punch anything. They should just punch each other.